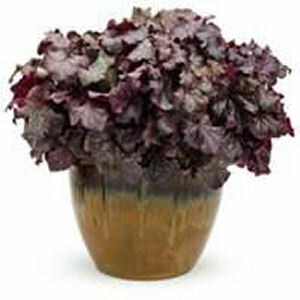 Heucheras in container gardens, also known as coral bells, are another of my favorite foliage plants. They are also sometimes called alum root. Heuchera have wonderful, large leaves that come in many textures – they can be frilly, curly or crimped, and they may be smooth, shiny or rough. Leaves may be solid colors, or have darker veins, or they may have color variations in the leaves. Coral bells range in color from white, lime green, or yellow, to burgundy, scarlet, dark purple to black. There are unending colors­­­­ with all of the hybrid cultivars now available. 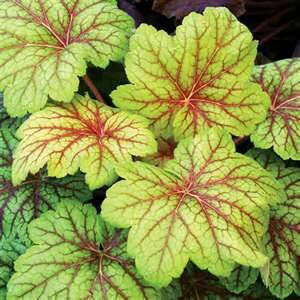 Foliage is what makes coral bells such great plants, but they do bloom beginning in early summer. Blooms are delicate, bell shaped flowers that grow on stems. They are generally red, white, pink or lavender in color. Once the bloom time is over, just break back the stems and enjoy the foliage of the plants all season. Heuchera can be enjoyed spring through fall. Coral bells grow to maybe 12-15 inches high, without blooms, and have a spread of about 15 inches although some can be as wide as 24 inches. They like moist, well drained soil and average potting soil with a little organic material added. Heucheras also have shallow roots so they don’t require a really deep container, but do add a layer of mulch to the container to help retain moisture. Don’t cover the crown of the plant with either soil or mulch – this is the place where the stems start to branch up or out from the main plant. Coral bells can be planted from seed, mature plants, or cuttings. I have never tried to grow them from seed, but I understand that it is very important to refrigerate the seeds for about six weeks before planting, and then you can sow them in very shallow soil just as you would start any other plant from seed. 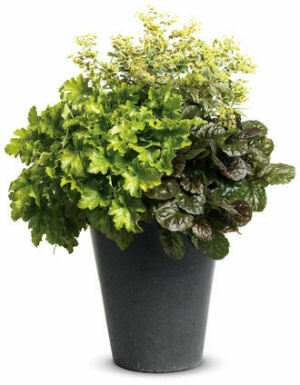 (See growing plants in containers for details) Directions on starting plants from cuttings can also be found there. 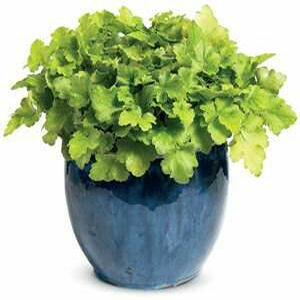 I have grown many heucheras in container gardens. I have had a lot of success with Proven Winners brand which is carried by my local garden center. Several of the examples on this page are Proven Winners. 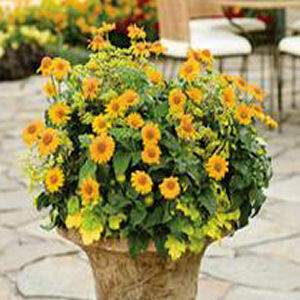 When your plant gets very large in its container, or stops blooming as much as usual, you may need to repot it. 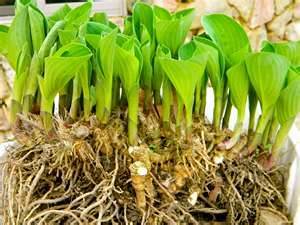 At this time, divide the plant at the roots and start two or three new plants. They do fine.You can multiply your coral bells just like you do hostas by division, as shown here. Just separate at the root ball and plant as usual. Keep the new plants well watered. Generally, heucheras prefer shady areas, but there are some varieties that like sun. Check to see which ones work best for your garden areas before you buy. 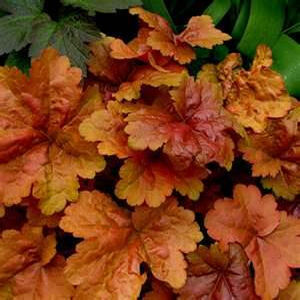 Coral bells can be planted with other shade plants – they work well with hostas, bleeding hearts, hydrangeas, ferns and astilbe. Varities that tolerate sun can be accompanied by lilies, columbine, or phlox.